One of the more difficult topics covered in the standard Organic Chemistry 1 course involves Nucleophilic Substitution and Beta Elimination Reactions, designated: SN1 SN2 E1 E2. how to reason between the different reactions rather than having you memorize molecules and formulas that will leave you confused and guessing. Think you’ve mastered it all? Jump right to my SN1 SN2 E1 E2 Practice Quiz! Also, check out the printable/downloadable SN1 SN2 E1 E2 Cheat Sheet for quick reference and review. Many students read ‘introduction’ and translate ‘skip this video’ I’m here to tell you NOT TO. 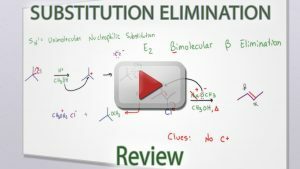 The introductory video is under 2 minutes long, and my goal here is to give you an idea of how to approach substitution and elimination problems when asked to differentiate between them all. This video will give you a quick overview/review of the individual reactions and mechanisms of SN1, SN2, E1, & E2 to prepare you for the detailed tutorials. This is great to watch as an overview before diving in, review in daily study, or review before quizzes/exams. When faced with a set of reactions conditions and asked to determine the type of substitution or elimination reactions, you cannot simply approach this with a set of memorized rules. Instead, you will have to analyze each aspect, one at a time, and find the reaction or reactions that best fit the given conditions. There are 4 major components to analyze prior to determining your reaction type. I will discuss each aspect in detail in its own video. The type of carbon holding the leaving group is very important when determining between a ‘1’ type reaction, which undergoes a carbocation intermediate, or a ‘2’ type reaction which occurs in a single step. What is the degree of substitution of the carbon holding the leaving group? Can a stable carbocation form? How bulky are the nearby groups, and do they provide steric hindrance? What is the availability and substitution of beta hydrogen atoms? These questions are discussed in detail in the following video. The attacking molecule in substitution or elimination reactions will be defined by the type of reaction that takes place. Meaning, if a molecule attacks a carbon forming a new bond and remaining attached to the chain, it has acted as a nucleophile. However, if instead the same molecule grabs a beta hydrogen atom without attaching itself to the parent molecule, it has acted as a base. Many bases make good nucleophiles and many nucleophiles make decent bases. When analyzing a reaction it may be difficult to predict substiution or elimination by looking at just the attacker, instead you have to take everything into account. However the attacking molecule will help you determine between a ‘1’ type and a ‘2’ type reaction. Once you have differentiated between the ‘1’ and ‘2’ type reactions, you want to refer to your starting molecule and solvent to determine if you will have substitution and elimination. 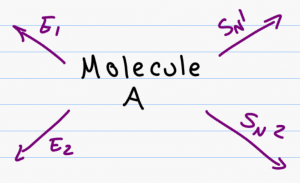 However, there are some attacking molecules that will easily help you differentiate between SN2 and E2. In this video, you will learn there is a unique type of base, which I refer too as the ‘triple B’ for Big Bulky Base, which acts as a terrible nucleophile. There are also some molecules that while weak in basicity actually make decent nucleophiles due to their polarizability. This video will help you understand understand what makes a solvent polar, and what makes a polar solvent protic or aprotic. Can the group leave? Will the group leave? This video breaks down the reaction, rate, and step by step mechanism for the SN1 reactions including a few simple examples to help you follow along. As you work through this video pay attention to the logic, concepts, and especially patterns. This video gives tricky examples involving less substituted carbocation intermediates followed by carbocation rearrangements and hydride shifts. 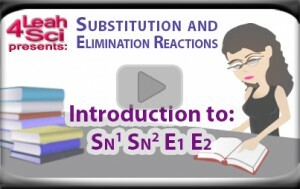 This video gives you a detailed overview of the SN2 reactions, reaction rate, step by step mechanism. Pay special attention to the features that determine an SN2 reaction and the potential chirality of the final product. This video shows you a breakdown of the chiral inversion to help you understand how easily to identify chiral SN2 reaction products. This video takes you through a more ‘tricky’ example of SN2 reactions. When faced with a bad leaving group, you must first ‘bribe’ the atom turning into a more willing leaving group before proceeding with the reaction. Having gone through this series, how do you feel about SN1/SN2 & E1/E2? After watching the series, the best way to understand if you’ve fully mastered the questions is to Test yourself! Try my SN1 SN2 E1 E2 Practice Quiz! Also, check out the printable/downloadable SN1 SN2 E1 E2 Cheat Sheet for quick reference and review.